Victory is built on how they are crowned! Columns is a two player stacking game in which you manage an inventory of pieces with the goal of capping the most columns. One player uses the set of light pieces, the other player uses the dark ones. Taking turns, the players thread their pieces over any of the 12 columns on the board without leaving gaps underneath. The playing pieces are of two basic types: "roundels" (disk-shaped beads) and "blockers" (square-sectioned pieces). 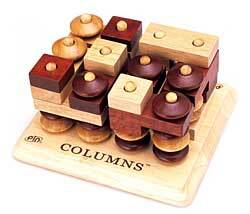 Roundels are used to score points by capping the columns, and are the only pieces that can score. - But the blockers prevent an opponent from placing a roundel above them, and so may be cleverly used to reserve places for your roundels on the top!